"Dead zones" are areas where the bottom water (the water at the sea floor) is anoxic — meaning that it has very low (or completely zero) concentrations of dissolved oxygen. 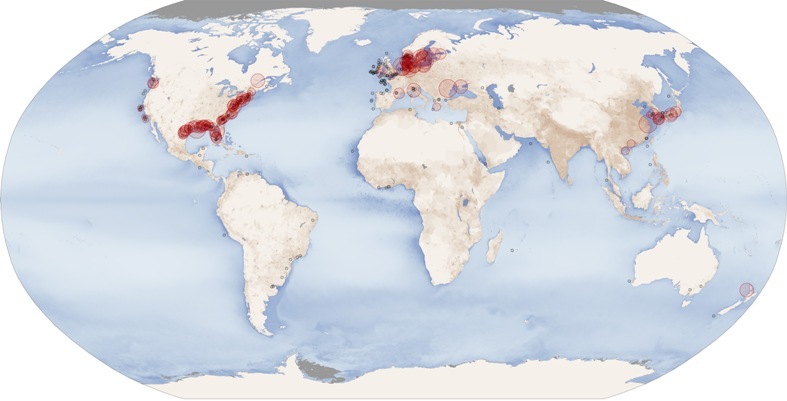 These dead zones are occurring in many areas along the coasts of major continents, and they are spreading over larger areas of the sea floor. Because very few organisms can tolerate the lack of oxygen in these areas, they can destroy the habitat in which numerous organisms make their home. 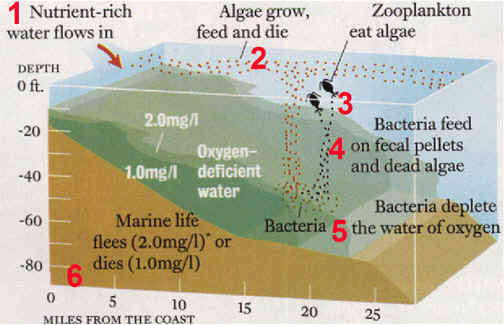 The cause of anoxic bottom waters is fairly simple: the organic matter produced by phytoplankton at the surface of the ocean (in the euphotic zone) sinks to the bottom (the benthic zone), where it is subject to breakdown by the action of bacteria, a process known as bacterial respiration. The problem is, while phytoplankton use carbon dioxide and produce oxygen during photosynthesis, bacteria use oxygen and give off carbon dioxide during respiration. The oxygen used by bacteria is the oxygen dissolved in the water, and that’s the same oxygen that all of the other oxygen-respiring animals on the bottom (crabs, clams, shrimp, and a host of mud-loving creatures) and swimming in the water (zooplankton, fish) require for life to continue. Sometimes we can observe the factors leading to a dead zone such as a large surface algal bloom or the consequences such as a fish kill however, dead zones are actually invisible. Dead zones occur worldwide. The second largest dead zone in the world is located in the U.S., in the northern Gulf of Mexico. Dead zones form when excess nutrients, primarily nitrogen and phosphorus, enter coastal waters and help fertilize blooms of algae. Major nutrient sources include fertilizers and the burning of fossil fuels. This huge influx of nutrients causes massive phytoplankton blooms to occur, this in turn leads to a large increase in zooplankton that feed on phytoplankton. Large amounts of dead phytoplankton and zoo- plankton waste then accumulate on the bottom of the seabed. The decomposition of this matter depletes the oxygen in the area faster than it can be replaced. This leads to large hypoxic areas called Dead Zones. 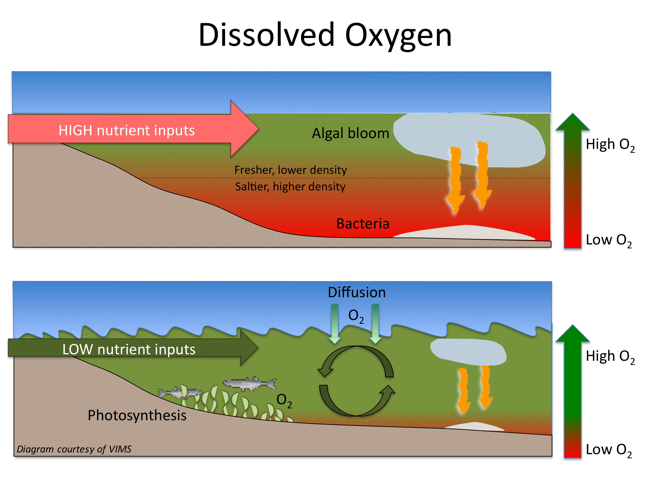 Hypoxia also can kill marine organisms that cannot escape the low-oxygen water, affecting commercial harvests and the health of affected ecosystems. The 530 areas and 228 sites together encompass more than 95,000 square miles, about the size of New Zealand. The largest dead zone in the United States, at the mouth of the Mississippi, covers more than 8,500 square miles, roughly the size of New Jersey. A large dead zone also underlies much of the main-stem of Chesapeake Bay, occupying about 40 percent of the Bay’s area and up to five percent of its volume each summer.